Often times, ‘Governance’ refers to the action and manner of governing. Corporate governance is the mechanism and process which companies and corporations are governed. It is primarily concerned with balancing the interest of stakeholders- which includes government, financiers, shareholders, management and the community at large. Corporate Governance can also be said to be the examination of the control of a company as exercised by its directors. The directors of companies are accountable for their actions to the company’s shareholders and other members of the company. However, in practice, the power of the shareholders to affect the behaviour of the directors is limited and rarely exercised. The issues of corporate governance have continually attracted considerable national and international attention. The current global financial meltdowns have necessitated the need for a critical focus on corporate governance. 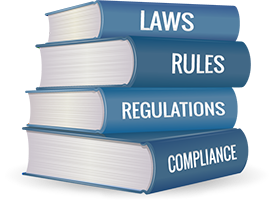 On the other hand, Regulatory Compliance is an organization’s adherence to laws, guidelines and regulation and specifications relevant to its business. However, violations of regulatory compliance regulations often result in sanctions which may also include fines. These sanctions are always imposed by regulatory bodies in accordance to statutes. Corporate Governance is an increasingly significant aspect of business and organizational management, extending to international politics and trade laws; and to globalized economics, corporations and organizations, and markets. In Nigeria, the laws that saddle each organization with the responsibility of corporate governance are the Companies and Allied Matters Act 2004, Investment and Securities Act 2007, Securities and Exchange Commission 2011. The major elements of corporate governance are good board practices, control environment, transparent disclosure, well defined shareholder rights and board commitment. The four pillars of corporate governance are accountability, fairness, transparency and independency (Omeiza Michael, 2009). Where any of these four pillars are lagging, there is every tend to a fall in the organization which often results to corporate scandals and failures. According to Sanusi (Sanusi JO (2003), “Embracing Good Corporate Governance Practices in Nigeria ”, A keynote address at the 19th Annual Bank Directors seminar organized by the Financial Institute Training Centre, June 19, Abuja); the widespread of corporate Scandals and failures that were witnessed in the Late 1990s and the early 2000s had their root in dishonest management decisions and in some cases, outright cover-ups of illicit activities. These, he said, had wrecked many companies and consequently, the lives of millions of innocent citizens who had a stake in them. A typical example of this is the gross financial misconduct committed by the former managing directors of commercial banks. Regulatory bodies such as the Nigerian Stock Exchange (NSE) and the Nigerian Securities and Exchange Commission (SEC) were found to have committed serious breach of corporate governance codes. The development of codes for best practice and stricter regulatory regimes which corporations are subjected to adhere was resulted to the largest extent from scandals and setbacks, where evidence of bad corporate governance has emerged which resulted in negative consequences in company’s share prices and the stock market generally. The benefits of being statutory and legally compliant include adequate disclosures and effective decision making to achieve corporate objectives; Transparency in business transactions; Protection of shareholders’ interests; Commitment to values and ethical conduct of business and long-term survival of the companies. Part of the key elements of corporate governance also tolls down to financial reporting and auditing, directors’ remuneration, the balance of power on the board of directors, risk management and communications between company and shareholders. Often times, investors have been concerned with governing policies of a corporation. The concerns of investors most times are about misleading financial statements and this has been a major factor in the development of corporate governance in recent years. Financial statements can be misleading, due to the selection of inappropriate accounting regulatory policies. Many companies choose not to allow their accounts department give a transparent report on the company’s performance and financial situation. Contrary to general opinion, directors are responsible for the accuracy of the financial statements, not the external auditors. The external auditors provide an opinion on whether the financial accounts appear to provide a true and fair view of the company’s performance and financial position (Brain Coyle (2009) Sixth Edition Institute of Chartered Secretaries and Administrators UK Study Text in Corporate Governance). The annual report and accounts of a company (and the interim financial statements of a listed company) is the principal way in which the directors make themselves accountable to the shareholders. The financial statement shows a report on the financial performance of the company over the previous year and the financial position of the company as at the end of that year. The directors’ report and other statements published in the same document provide supporting information, much of it in a narrative than numerical form. For larger companies, the annual financial statements and elements of annual report are audited by a firm of independent external auditors. Shareholders and other investors use the information in the annual report and accounts to assess the stewardship of the directors and the financial health of the company. Compliance with relevant accounting policies eliminates the risk of misleading or false financial reporting, enhances the integrity of the external audit process, places emphasis on effective communication and disclosure , facilitates accountability and transparency which have a direct impact on the company’s performance and the calibre of investors attracted to an organization. Good corporate governance is very important because of its role in attracting foreigners and investors to a company. The board of directors have a responsibility to govern the company in the interest of the shareholders and other stakeholders. A part of this responsibility is to decide the objectives and strategic direction for the company, to approve detailed strategic plans put forward by management, to monitor and review the implementation of those plans. An important objective of a commercial company is to make profit, and the company’s strategies should be directed toward this. However, any business strategy involves taking risks and actual profit may be higher or lower than expected. When very big risks are taken, a company might even become insolvent and go out of business if actual event turn out much worse than anticipated. Bad corporate governance can result in the insolvency and collapse of a company, and excessive risk-taking is an aspect of poor governance. The board of directors should take business risk into consideration when making its strategic business decisions. The board of Directors are given the responsibility to choose policies that are expected to be profitable, but should limit the risks to a level that is considers acceptable. For example, when the board takes major investment decisions itself or decides on corporate strategy, risks as well as expected returns are properly assessed and thus are exposed to less reputational risk. A company that is complaint with laws, rules and best practices have a higher likelihood of achieving financial success. “If a country does not have a reputation for strong corporate governance practice, capital will flow elsewhere. If investors are not confident with the level of disclosure, capital will flow elsewhere. If a country opts for lax accounting and reporting standards, capital will flow elsewhere. All enterprises in that country, regardless of how steadfast a particular company’s practices, may suffer the consequences. Markets exist by the grace of investors. And it is today’s more empowered investors who will determine which companies and which markets stand the test of time”Arthur Levitt, a former chairman of the Securities and Exchange Commission commenting on the numerous corporate scandals in the US in 2001, 2002). Until recently, Corporate Scandals were unheard of in Nigeria and even where they were reported, no known deterrent sanctions have been meted out on the culprits. This is because Nigeria lacks the necessary political and institutional framework to enforce good corporate governance. Corporate governance is no longer a new concept worldwide but a norm of corporate behavior and performance expectations. Nigeria cannot differ in ensuring compliance. Regulatory Compliance enhances the stability and soundness of a company through improved corporate performances, the effectiveness of boards and has an impact on the company’s performance. Corporate governance is not just about playing “watchdog” over management, it is more about enhancing corporate strategic choices, acknowledging and responding to the interests and concerns of stakeholders, developing and bolstering managerial competencies and skills and ultimately protecting and maximizing shareholder wealth. In order for investors and shareholders to be rest assured of protection against the malfeasance of corporate managers in the companies and public institutions, governance must be compulsory and compliance must be enforced. Opeyemi Adagbada is a lawyer with keen interest in Corporate law and Regulatory compliance.